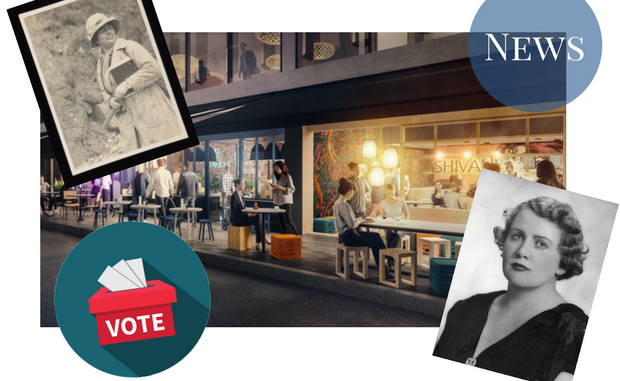 Students can now vote for the names for three streets and one teaching building in the Kambri redevelopment, from a list of women who had a role in “shaping” ANU. Candidates include the first woman to graduate from ANU and the first female Australian senator. Twelve names have been proposed, with ANU considering the “top four results from the poll”. The University held back from an outright commitment to use the names however, saying the results would “help to choose the final names”. ANU also specified that the teaching building must be named after a former member of ANU’s academic staff. Voting is now open, and will close on the 4th of April. The available building is ANU’s signature 6-story teaching centre, which will include several classrooms, study areas, and a top-level “superfloor” of flexible teaching space. The streets to be named are the laneway between the teaching building and Chifley Library, and the two loop roads: one will extend the road between CBE and the Copland Precinct from Barry Drive, and the other is to stretch between where Manning Clarke once stood to the east end of Chifley Library. Names were decided by the redevelopment project’s ‘Naming Committee’ which includes student and academic staff representatives. The Committee took suggestions from the general public, which were advertised earlier this year, and selected these nominees. ANU noted that the committee ruled out any individuals currently associated with the ANU. The announcement coincides with International Women’s Day, and ANU said the move was intended to “celebrate” the day, although Deputy Vice-Chancellor Marnie Hughes-Warrington promised there would be more female names in the redevelopment last year. Susan Liesching was the first woman graduate from ANU in 1954. Her thesis was titled: Church and state in Australia: the background and implications of separation. Helen Crumpston was Tasmania’s first woman law graduate and held a temporary lectureship in Modern History at Canberra University College. In 1954 she joined ANU as a Graduate Assistant providing administrative support services for postgraduate students and assisting in legislative problems. Patricia ‘Pat’ White joined ANU as a Graduate Assistant in 1962. She was promoted to Assistant Registrar in charge of student records, holding this position until her retirement in 1981. Maude Woolcock was a Senior Librarian at the ANU for 20 years between 1961 and 1981. She joined ANU as a Library Assistant in 1948. Dr Germain Joplin was a Research Fellow in Department of Geophysics from 1952 and an ANU Council member from 1969. She was awarded W. R. Browne Medal in 1982. Phyllis Hohnen is a former teacher whose community work in Canberra supported the very young and very old. She has been attributed to helping build the ANU Community. Helen Hughes was a foundation leader of the National Centre for Development Studies – a key component of the ANU Crawford School, and was the first women director of a Centre at ANU. Dr Joyce Fildes was an early member of academic staff at ANU and worked at the University for over 30 years. She joined the John Curtain School of Medical Research (JCSMR) in 1956 as a Research Fellow. Patricia Tillyard is a tireless advocate for philanthropy and a significant donor to ANU. She was a suffragette and Board member of The National Council of Women, The Association of Women Graduates, the Y.W.C.A and Girl Guides Association. Senator Dorothy Tangney was the first woman member of the Australian Senate in 1943 and served on ANU Council from 1951 to 1968. During this time she was the only woman on the Council. Dr Marie Reay is a prominent anthropologist, best known for her research in the highlands of Papua New Guinea and the Kuma people. She was an ANU Council member from 1969. Mary (‘Mollie’) Bouquet was an Administrative Assistant at the Canberra University College from 1956. Her duties both before and after amalgamation of the College involved the servicing of the academic board and the administration of academic staffing.